It's powered by a Euro 4 compliant liquid cooled 999cc inline-4 engine, producing 189bhp at 13,000rpm and maximum torque at 11,000rpm. Compared to the outgoing 2014-2016 model 90% of the main components have been upgraded, power is up by 10.7bhp, weight down an amazing 14kg and as a result power:weight is up roughly 14%. The new muffler accounts for 2.8kg off the weight, the engine 2kg and the smaller Titanium fuel tank 1.3kg, with minor amounts off the frame, swingarm, calipers, wheels, radiator and slipper clutch as well. The electronics package is impressive, with new cornering ABS taking input from the Inertial Measurement Unit (IMU), traction control with three modes and wheelie control. Track mode gives you full power with Winding and Street offering increasing levels of torque control and engine braking. There are also two user modes where any of the various systems can be set at the level you prefer; the torque control offers 9 levels of adjustment and there are 5 levels of power to choose from. Check the pics above for all the combos. The fancy new colour TFT dash has three modes to play with in Street, Circuit and Mechanic. Street is the base mode, Circuit adds lap times/counts/best lap and Mechanic adds things like grip angle, coolant temperature and battery voltage. The 5 split-spoke 17" wheels take a Bridgestone S21 120/70 tyre at the front and 190/50 at the rear. Accessories include a quickshifter (£695), colour-coded rear hugger (£195) and colour-coded seat cowl (£195). 2019: Electronics update separating wheelie control from traction control and slightly updated paint schemes. The £19,125 SP version gets you a quick shifter with downshift assist, Ohlins S-EC semi-active suspension and Brembo brakes with new high performance brake pads. 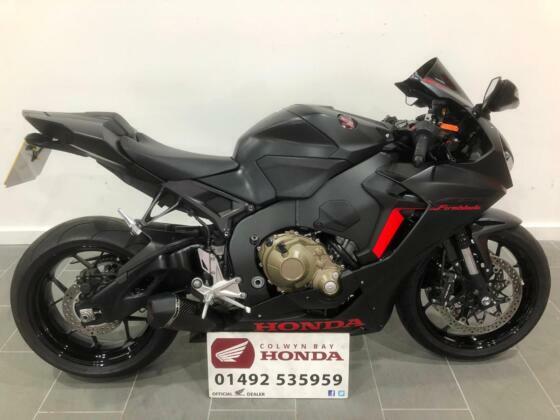 It's 1kg lighter than the base Fireblade, but has a lower 820mm single seat and is available in a red/white/dark blue colour scheme, with silver frame and gold wheels. For the princely sum of £22,250 you can have the rare Fireblade SP2 however only 150 of the 500 production run are coming to Europe. The colour scheme is similar to the SP but with a light blue/gold detailing and you get bronze spiral Marchesini wheels. The main difference lies in the revised cylinder heads derived from the RC213V MotoGP machine and the availability of a race kit. It also weighs in at 195kg. The CBR1000RR launched in 2004 with a 998cc inline four engine, producing 172bhp at 11,250rpm. 2006 shaved 3kg off the weight with a new exhaust system and lighter swingarm. 2008 increased the power to 175bhp at 12,000rpm from an all new 999cc engine. The exhaust is now side mounted rather than under the seat. 2009 introduced optional C-ABS, but this adds 11kg to the weight. 2010 didn't change much beyond a re-designed muffler, quick release licence plate and tidying the design of the tail light. 2012 introduced new 12 spoke cast Aluminium wheels, improved fuel injection, sharper nose and LCD dashboard. 2014 launched with a tweaked engine and better mid-range torque. 2017 saw 90% of the main components upgraded, power up by 11bhp, weight down 15kg and power:weight up 14%. Three versions were available including the SP with Ohlins/Brembos and the limited edition SP2 with Marchesini wheels.